This is, in fact, what you were called to do, because: The Messiah also suffered for you and left an example for you to follow in his steps. For ye were called for this. 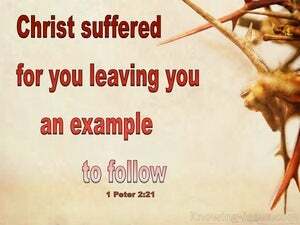 Because Christ also suffered for us, leaving you an example, so that ye should follow his footsteps. For even to this were you called [it is inseparable from your vocation]. For Christ also suffered for you, leaving you [His personal] example, so that you should follow in His footsteps. [After all], this is what you were called to do, because Christ also suffered for you, leaving you an example, so that you would follow in His steps. To this, indeed, you have been called; because even Christ suffered for us, leaving you an example, that you should follow his footsteps. For to this you have been called, because Christ also suffered for you, leaving you an example, that you should follow in his steps. That is the life to which you have been called, for Christ himself suffered for you, leaving you an example so that you might follow his footsteps. It is your vocation; for when Christ suffered for you, he left you an example, and you must follow his footsteps. For it was to this that you were called! For Christ, too, suffered--on your behalf--and left you an example, that you should follow in his steps. 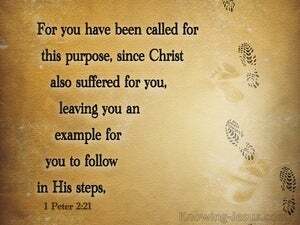 And it is to this you were called; because Christ also suffered on your behalf, leaving you an example so that you should follow in His steps. Indeed, it was to this kind of living that you were called, because Christ also suffered for you, leaving you an example that you might follow His footsteps. For unto this are ye called; because Christ suffered for you, leaving you an example, that ye might follow his steps.